A Cooking Bookworm: Skin MD Natural - Review and Giveaway! I'm not sure about you, but just before Thanksgiving to just after Christmas, my hands are busy cooking and baking and cooking and baking. My hands are also the only dishwasher in my house, and all of that cooking and baking creates sinkload after sinkload of dishes! When Skin MD Natural asked me to review their shielding lotion, I was more than willing! The first thing I noticed when applying Skin MD Natural was the smell...or lack thereof! You can occasionally smell a slight aloe scent, but it is so minimal, I'd call it unscented. Unscented, for me, is a GOOD thing! The next thing I noticed about Skin MD's shielding lotion was how light and non-greasy it was. The lotion absorbed into my skin almost immediately and a very small amount went a long ways! Skin MD Natural is not an ordinary lotion. 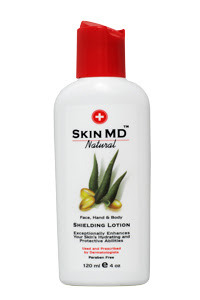 Skin MD Natural is a specially formulated shielding lotion. "Shielding lotion is a lotion that forms a protective barrier on the skin and keeps out irritants and chemicals. It also allows the natural oils and moisture to remain in the skin so it can heal better. It is a big advantage that shielding lotions are light and go on without a greasy mess," says Dr. Brian Zogg, a dermatologist in Albert Lea, MN. "When you have dry, itchy skin you know that the protective outer layer of skin has been stripped away. In southern Minnesota most people need to use a shielding lotion. In the winter they all get very dry skin. We also recommend shielding lotions for anyone who is exposed to chemicals in their work environment. Your skin is exposed to irritants and chemicals almost every day, even in a normal household environment, so a shielding lotion can be a useful dry skin care solution for most people.. And it won't create the negative moisture message skin can get from conventional lotions. The artificial moisturizers in conventional creams and lotions can send a signal to the moisture producing parts of your skin that enough moisture is present. Your skin then makes less of the natural moisture needed to resolve a dry skin problem. With a shielding lotion you protect your own natural oils and moisture in the skin, so it heals faster," says Dr. Zogg. I used Skin MD Natural for 2 weeks, using no other moisturizer or lotion. I was most impressed with the change on my face. I don't like to use lotions on my face, because of the greasy feel. No greasiness with Skin MD Natural, and the dry patches I get in the winter disappeared when using the shielding lotion. Skin MD Natural was also a wonderful lotion to use on my children. My son, especially, gets dry patches on his legs and cheeks. Skin MD Natural was gentle and cleared up his painful dry skin. I didn't notice as big of a difference on my hands as I did with my face. But, the overall results of Skin MD Natural make me happy to have a bottle on hand, for me and the rest of my family! Want to BUY IT? You can check to see if any pharmacies near you carry Skin MD Natural, or you can order online! Want to WIN IT? 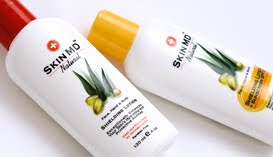 Skin MD Natural wants to give a bottle of Skin MD Natural to one of my readers, so they can also see the difference a shielding lotion can make! To enter, tell me what you do or use to help your dry skin! Entries accepted until Saturday, January 16, 11:59 PM. (Any duplicate or unqualified entries will be deleted). I use Eucerin Calming creme. lots of great psoriasis info on the site - Many dermatologists are recommending patients use both prescription and natural treatments to control psoriasis outbreaks. Right now I use an Aveeno lotion, but I'd love to try this! I currently use vaseline lotion. My entire family has try hands and my mom gets dry feet and she's a diabetic. 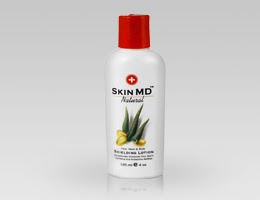 Visit Skin MD Natural and tell me something you learned: I learned that that it contains Aloe which rejuvinates the skin and vitamin E.
Right now I just use a off brand Target moisturizer, but I am desperate for something that works better! Ugh...this winter nothing is working. Vanicream usually works best for me.